Home→news→Did KGET TV-17 report violate journalistic ethics? Did KGET TV-17 report violate journalistic ethics? Did a local reporter and television anchor violate journalistic ethics in yesterday’s report on Terri’s “tactics” relating to a 14-year-old whose baby was aborted this week? Consider the evidence below. Terri was unavailable because she was on her way to our pregnancy center in Taft. She was also experiencing some health problems, so I considered shielding her from the stress of these false accusations. But eventually it became clear that Channel 17 was going to make this a big story on the Wednesday evening broadcast, with or without a comment from Terri. 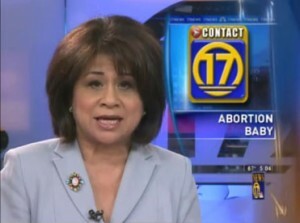 Story: A 14 yr old girl became pregnant and decided to have an abortion. Upon being at the clinic she had a change of heart. She spoke to Terri (protestor from Life house) and Teri asked for her number for support etc. Well, the girl thought things through and decided it was best for her to go through with it. The moment she walked out of Family planning she recieved a text from Teri, saying, “I named your baby Brittany” and on the grassy area was a pink cross with the name “Brittany” written on it. I know Teri has a right to protest & the freedom of speech but did she go too far with this? She could have all the crosses she wants out there but were her actions appropiate? Its a difficult time for any woman of any age to go through and when this girl saw this she broke down. Was it right for Teri to contribute to the break down of this girl’s mental & emotional state? One of the most beautiful things about the way Terri ministers to pregnant women is the fact that she allows herself to get emotionally involved, especially when a girl changes her mind about abortion. But this leaves Terri vulnerable to being deeply hurt when someone decides to go through with aborting her baby after Terri had helped her to change her mind. She also gets deeply hurt when others misrepresent her motives or actions (which, again, happens all too frequently). Terri was already hurt over what happened with Kelly, but it looked like there was nothing I could do to shield her from the further pain which she was about to experience. A few hours after I received Mike’s call and email, I received a call from KGET reporter Leslie Lopez. Leslie wanted to interview Terri (and only Terri), and made it clear that the story would be on the news that same night (Wednesday). Leslie also came out to the abortion chamber during this time, videotaping the crosses and the people who were praying, so it was clear that with or without Terri, the story would go on. I contacted Terri, who arranged to meet Leslie for an interview at 2:45 pm. Terri asked Leslie who else would be interviewed for the report, and Leslie said a local psychologist would talk about why she opposes Terri’s tactics. When Terri met with Leslie, she asked her if Channel 17 had received the news tip from the family of the 14-year-old girl. Leslie said that the message did not come from the family, and that they had not had any contact with the family. As she handed Leslie the phone, Terri made it clear to the reporter that the girl’s phone number was off limits. Terri’s phone displays text messages in a conversational format, so the information identifying Kelly appeared only at the top of the screen. Terri thought that it would be easy for Leslie to avoid identifying the girl, and Leslie assured Terri that her private information would be protected. When it appeared that Leslie was looking at Terri’s phone longer than necessary, Terri began to wonder if Leslie was looking at other private messages. So Terri told the reporter “the message about the cross is at the bottom” (because that message was supposed to be the focus of the news report). Leslie spent a few more seconds on the phone before handing it back to Terri. Then Leslie told Terri “it looks like we will be putting this story on tomorrow night instead of today.” Up until that point, Leslie had been insisting that the story would be broadcast on Wednesday night (otherwise, Terri would not have needed to hurry back from Taft). What had changed? A possible clue was received on Thursday (the day following Terri’s interview with Leslie) in a text message to Terri from Kelly. She told Terri that she didn’t appreciate Terri giving her phone number to the reporter. Terri hadn’t even known that Kelly had talked to the reporter until that afternoon. 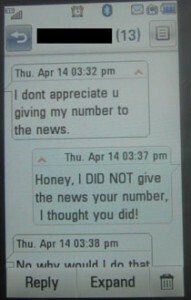 Terri responded to Kelly, explaining that she had not given her number to the reporter. Assuming that Kelly’s family had somehow become involved, Terri asked Kelly if her family had given her number to the reporter, and Kelly said that they had not done so. At this point, the pieces seemed to fall into place. Could it be that the reporter used Terri’s phone not only to record the controversial text message, but also to locate Kelly’s phone number? That seemed to be the likely conclusion. So at about 4:30 pm, Terri called Robin Mangarin to tell her that it was wrong for the reporter to take Kelly’s number from the phone and to call Kelly. Robin responded by claiming that the family gave the reporter Kelly’s phone number (this became the lead sentence on Robin’s broadcast). So could it be that the original email to KGET came from Kelly’s family after all? Could it be that the reporter initially denied this when talking to Terri just because she didn’t want Terri to know? Could it be that this very family member who expressed so much concern about Kelly’s “mental and emotional state” deliberately upset Kelly by giving her phone number to the reporter without Kelly’s permission or knowledge? Or isn’t it more likely that Leslie found Kelly’s number on Terri’s phone, which caused Leslie to move the story from Wednesday to Thursday because she suddenly needed time to contact Kelly? Will anyone take the time to investigate this? Not likely, in a community where crimes against a 14-year-old are ignored while those who try to help her are demonized. Teri, in all do respect it doesn’t even matter how the reporter got a hold of the girl. Anyone could have sent the email for all we know the girl herself. If you don’t feel you’ve done anything wrong then don’t worry about it. The godly thing to do would be to let it go and not start this she said, he said tug of war.I imagine its hard enough on the girl to begin with and after seeing the majority of people bashing her on facebook I would say let it rest already.